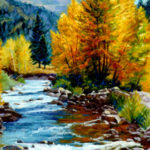 Tahoe Art League, Women Artist of the West, Associate. I paint with oils. 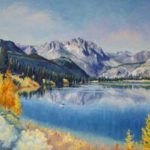 For the last several years, I have shown my paintings in the “Valhalla Arts and Music Summer Festival” at the Tallac Historic Site in South Lake Tahoe. When my granddaughter asked why I don’t paint “make believe,” my first response was that I like to paint real places. But, her question did provoke more thought on the subject. I can’t remember when I first started to appreciate the land around me, from the majestic Sierras to a quiet vignette of a stream as seen through a space in the trees. 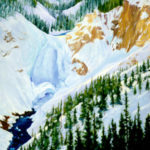 I have spent much time in Sierras hiking, skiing and photographing. They always invoke a sense of awe. One of the most spectacular drives is up the Eastern side of those towering ramparts from Lone Pine through Carson Valley. 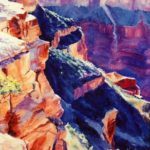 There are other favorite places to paint, such as the Mother Lode Country, Yosemite, Grand Canyon, California Wine Country, Glacier/Waterton Parks, Grand Tetons and Yellowstone. But, I find myself coming back to those Sierra scenes. 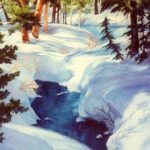 I love how the snow lies in those great crevasses or the play of sunlight and shadow on fresh snow, sometimes laced with the tiny prints of a small creature. I also love the reflections in still water, the colors and light in a moving stream and the split wood and wire fences that contour the Sierra foothills. 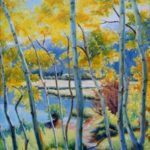 And what landscape artist could resist the blaze of those “Aspens” in the fall? 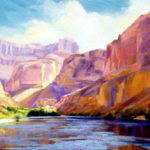 Seriously, I love painting the “Western Landscape.” I love experiencing, photographing it and painting it. 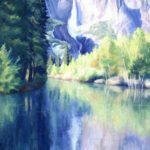 I paint with oils in a representational, impressionistic style; emphasizing the color of the “High Sierras.” For me, the landscape presents itself so well; I see no reason to abstract it. I hope my paintings convey a sense of awe for the world around us. My “Love” of art started with grade school art projects, continued through high school classes and on into majoring in art at the University of Illinois. I did drawing, composition, sculpture and graphic arts, but mostly painting. But, I felt very limited in what I could paint. I left to marry and “create” a family, taking a few classes at local colleges and doing a few paintings at home. 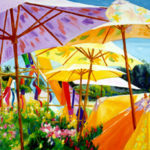 In 1994, I started taking painting classes at the California Art Institute in Westlake Village, CA. There I learned the importance of value, color and technique. I had two excellent teachers, Martha Saudek and Myrna McKee; and the proverbial doors opened to me. I was finally able to paint any scene I wanted. 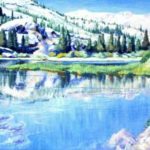 In 1995, I entered my first juried show and one of my paintings was selected for the cover of the Westlake Village Art Guild’s calendar “A California Canvas”. 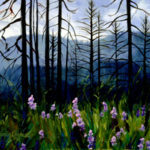 I continue to enter regular and juried shows and have won more awards. In 1996, I started doing commercial shows throughout California: La Quinta Art Festival, Artwalk in Thousand Oaks, Fine Art Santa Barbara, Los Altos Rotary Show, Mammoth Lakes Labor Day Show and Marin Art Festival in San Rafael. I have sold well over 100 originals to friends and collectors, some have a number of my paintings. I continue to paint fewer, more quality paintings, sometimes for the location of the show. 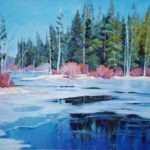 I regularly have my paintings in the Brewery Art Center Gallery in Carson City, NV and The East Fork Gallery in Gardnerville, NV. 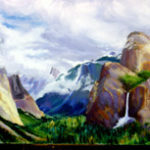 My paintings have hung in the Yosemite Museum Gallery, Mountains to the Sea Gallery in Malibu, the Sierra Pacific Power Co. Corporate Offices in Reno, the Ansel Adams Gallery in Lee Vining, CA. the River Gallery in Reno, the Reagan Presidential Library in Simi Valley, CA, the Hart Park Ranch Gallery in Santa Clarita, CA, the Celebration of Western Art in the Cow Palace in South San Francisco, the Record Courier Offices in Gardnerville, NV, the Nevada Appeal offices in Carson City, NV and the Nevada State Library and Archives in Carson City, NV.